The 2018 Mercedes-Benz S-Class sedan is superlative in every way. It is capable of producing more than 600 horsepower, and is also the first sedan ever to have 100% LED lighting. And thanks to high-tech features like smartphone app integration, your Huntington commute will be upgraded in every way. This is the sedan for drivers who expect the best without fail. Explore what makes the S-Class lineup so exceptional at Mercedes-Benz of Charleston, where we have a varied S-Class inventory. The MSRP for this model starts at $89,900. Under the hood is a biturbo 3.0L V6 engine that puts out 362 hp and 369 lb-ft of torque and leaps from 0-60 mph in only 5.1 seconds. It is paired with a nine-speed automatic transmission for refined driving, and an ECO-START®/stop system for improved efficiency. 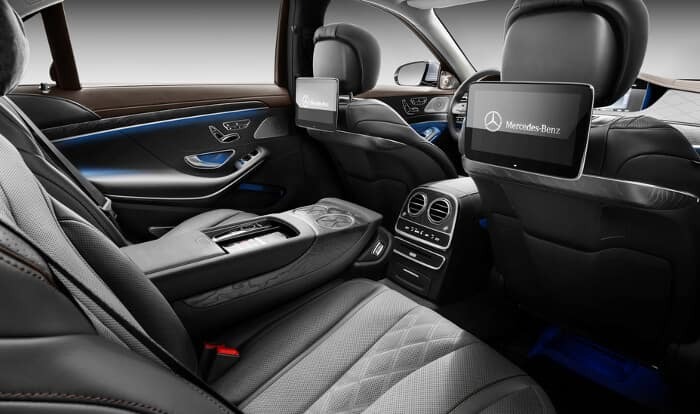 Standard features include 16-way power front seats with memory settings, a pair of 12.3-inch display screens for cabin connectivity, and a 13-speaker Burmester® sound system. With the addition of 4MATIC® all-wheel drive, the MSRP of this version climbs slightly to $92.900. But as a result of this advanced performance upgrade, the sedan gets far better traction when the roads are slick. But despite road conditions, this version of the S-Class handles better than ever. Aside from the performance boost, the list of features is the same as the previous model. And like all the models in the lineup, this one has a spacious 16.3 cubic feet of room in the trunk. This sedan travels with authority on the roads of Beckley thanks to the biturbo 4.0L V8 engine under the hood and the 4MATIC® drivetrain. The power ratings are elevated to 463 hp and 516 lb-ft of torque, and the 0-60 mph time falls to 4.6 seconds. The MSRP of this S-Class starts at $102,900, and the list of standard features includes impressive selections. Open up the panoramic sunroof, set two different climate controls, or take advantage of keyless ignition and entry. You also have the option to add features like a 4G LTE connection or a rear-seat entertainment system. This is the strongest sedan in the lineup, which is why the MSRP starts at $147,500. Racing engineers designed the handcrafted biturbo 4.0L V8 engine under the hood, and as a result it produces 603 hp and 664 lb-ft of torque. And with 0-60 mph times clocked at only 3.4 seconds, it leaves everything else in Charleston, WV in the dust. The interior features are largely the same, but the performance is further upgraded by AMG® enhancements to the suspension, brakes, exhaust, and 4MATIC® drivetrain. The 2018 S-Class sedan projects prestige and prominence. The 18-inch twin 5-spoke wheels contribute to this model’s distinctly stylish look, while the LED lighting in both the front and back gives the model a bold look while improving visibility for all. And thanks to smart features like a power trunk lid, it’s easy to interface with your vehicle and take more hassle out of travel. The S-Class stands out wherever it goes, yet never appears out of place. The cabin of the latest S-Class is truly something to behold. It comes standard with premium leather upholstery that looks as good as it feels, and ambient interior lighting in three distinct zones allows you to customize the mood inside the vehicle. Meanwhile, the dual-display screens give you easier access to a deeper level of on-the-go information, assistance, and entertainment. 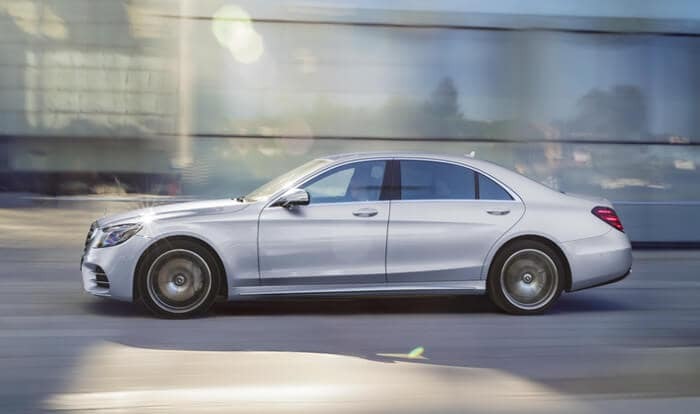 This is also the largest sedan in the Mercedes-Benz lineup, ensuring that each of the five seats provides plenty of leg, head, and shoulder room. Head Up Display – Important information like current speed and navigation are displayed right on the windshield so the driver can keep his focus on the road. PRESAFE® – This system detects when a collision is imminent and instantly prepares the cabin to minimize the potential for injury during the impact. 4G LTE Wi-Fi – With on-the-go Internet, everyone inside the vehicles has access to endless information and entertainment using multiple devices at the same time. Advanced Navigation – Turn-by-turn driving directions are supplemented with real-time traffic updates to help drivers avoid backups and delays. Intelligent Light System – The LED headlights rely on sensors to determine where illumination is most important and direct light to that location. This is a truly elite lineup of sedans, but you’ll want to consider all the Mercedes-Benz sedan options and see how it compares to the Audi A8 before making your final decision. No matter what you choose to drive, the team at Mercedes-Benz of Charleston is here to provide you with the guidance and service you expect, including simple financing. Pay us a visit soon, and contact us with any of your questions.